Where Did We Last See KF6GPE? Uses APRS on 144 MHz, 4G networks, and WiFi with APRSdroid and a Kenwood TH-D72A HT. 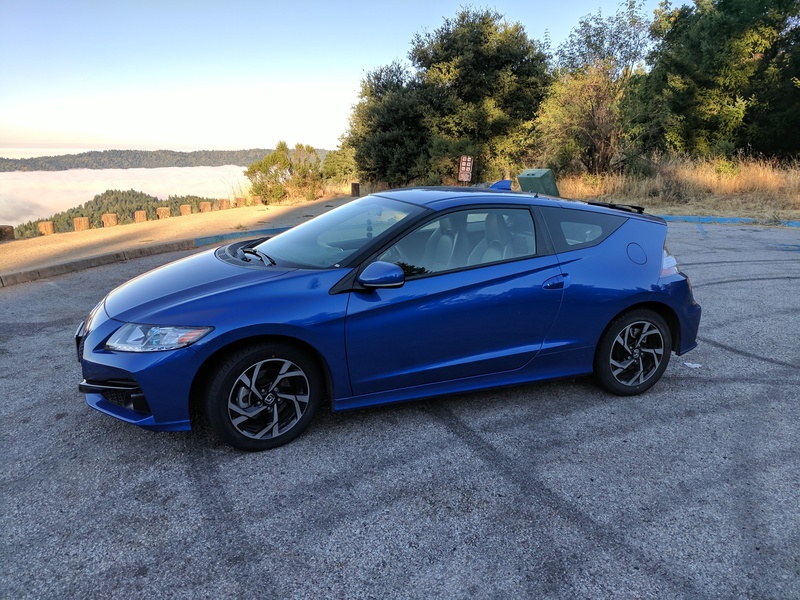 The usual configuration when I operate mobile in my 2016 Honda CR-Z is an older Kenwood TH-D72A and a newer Kenwood TH-D74A, all running off of a three-port 12V extension outlet that includes a built-in voltmeter run to the ignition-switched 12V car outlet. The 'D72A is tuned to 144.390 MHz. The 'D74A is used for D-STAR, FM phone, and secondary digital operations (such as Winlink). Radios are connected to a dual-head Lido mount attached to a seat bolt. 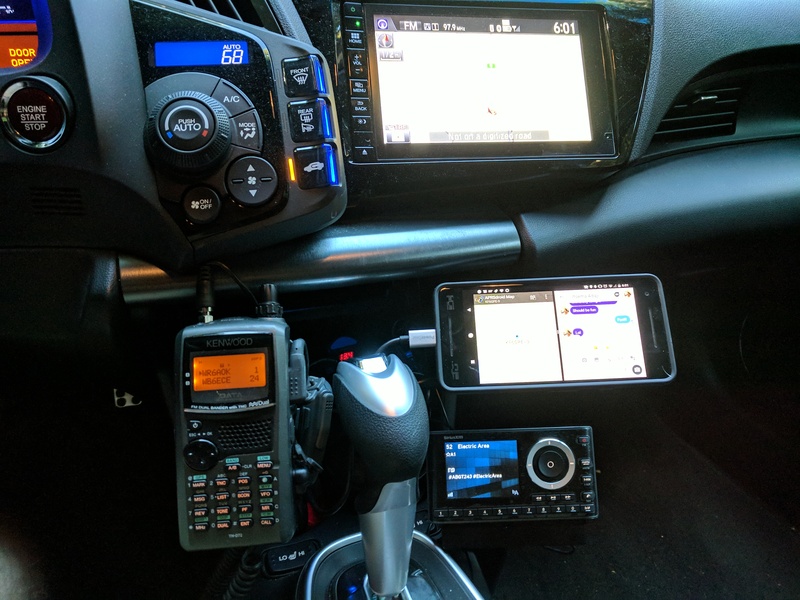 For software, I run APRSdroid connecting to a Google Pixel 3XL, mounted on a vent mount above the radios. APRSdroid connects over Bluetooth to either the TH-D72A or TH-D74A, depending on what I'm using the radios for. In the event that I do not want to use my cell phone, I can tune the either radio to the APRS frequency and activate the radio's APRS mode start the TNC for stand-alone beaconing. For antennas, I use a couple of dual-band low-profile magmount antennas. I can't remember who made them; they've been moving from car to car to car for about fifteen years. I would not be surprised if they are from MFJ Enterprises, though. The coax runs along the center console, along under the back cargo shelf, and then up and through the rear hatch and on the rear of the vehicle. When pedestrian mobile, I either use the same Android phone running APRSdroid over WiFi and 4G with Project Fi (depending on where I am), or my Kenwood TH-D74A. I have been known to throw the 'D74A in a cupholder in my wife's car when I drive that somewhere too, or else just use the phone and the cellular network again. I have written a small Python service that uses aprslib to connect to the global APRS-IS feed and harvest the position data that I beacon. This service makes the latest position packet contents available via a REST web service, and then this page queries that service and uses the data it gets and Google Maps to generate a static map with the marker you see. Occasionally, the map may fail to load. This can happen because my service keeps only a memory-resident cache of where I've been; if the server is restarted and I have not sent a position packet, no data is available and you'll see a placeholder image. Someday I'll modify the service to occasionally dump its in-core contents to disk, and load that image from disk when the service starts. Currently, restarts are infrequent enough that this shoudn't happen very often. Copyright © 1996-2018 Ray Rischpater. All rights reserved unless otherwise noted.